Think that kid-inhabited households have to wait for high-end remodels? Think again. 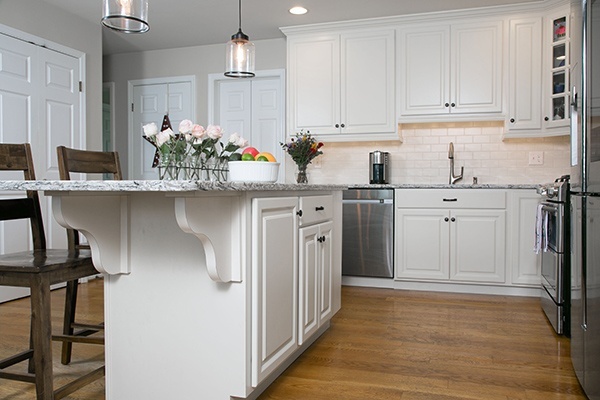 Our Remodel of the Month proves families can enjoy a sophisticated, transitional kitchen design - and an all-white one to boot! This stylish homeowner/mom pushed the 'kitchen design envelope' to create a trendy, yet kid-friendly design. This homeowner has wonderful taste and her inherent design eye, paired with our professional design-build team, made for a mixed-materials layout. 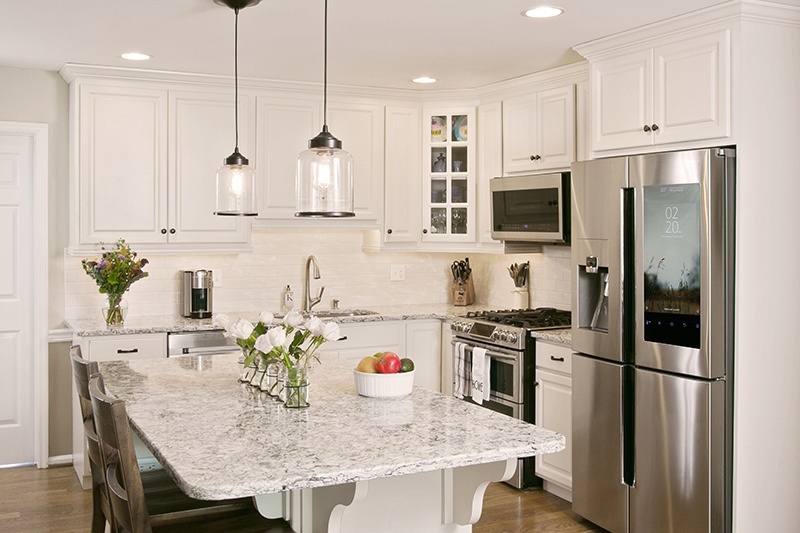 Now, her transitional kitchen design boasts contemporary style along with traditional, homey charm. For many parents, a kid-friendly kitchen design may translate to "sacrificing what we want for features they can't destroy." 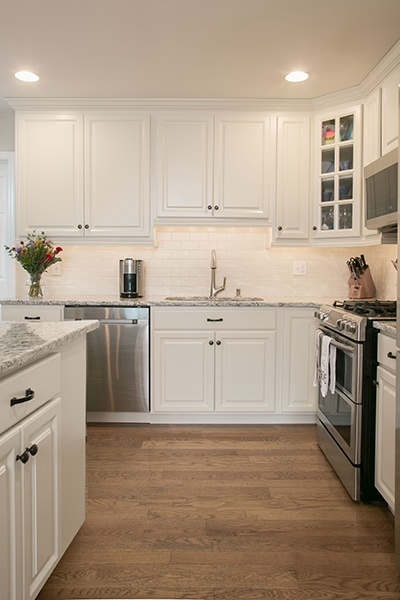 That's not the case at all as this Chadds Ford, Pennsylvania remodel attests. 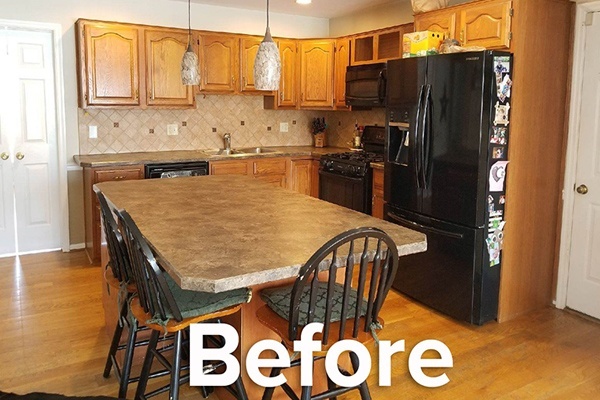 Our homeowner /mom was ready to transform her darker, and storage-in-efficient kitchen into something more pleasing to her eye and that accommodated her little ones, who spend the majority of their after school time at the kitchen island doing homework. We were excited to show off Kitchen Magic's penchant for creating custom kitchen designs that are durable and low-maintenance (aka - kid- and mom-friendly), while promoting stylish and luxurious finishes. While the homeowner thought the existing Cherry wood cabinets had inherent beauty, they were too dark for her household. For the new design's foundation, she opted for a clean, bright aesthetic, using a timeless, white kitchen palette. Classic, raised-panel square doors in Antique White continued this motif. 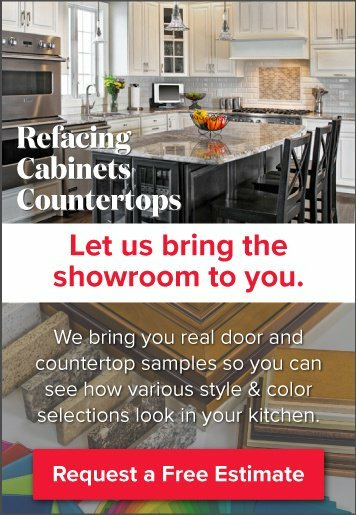 The cabinets are high-quality but their laminate finishes make them ultra-durable and easy-to-clean when splattered or smudged. A white, solid-surface, subway tile backsplash creates a subtly textured transition between the cabinets and countertops. The color is Whipped Cream with a white background and wisps of cream throughout. There was no doubt that Cambria quartz coutnertops were the way to go for a luxurious look that is as durable and low-maintenance as can be. With that in mind, she chose the Bellingham pattern - a classic, black-and-white, granite replica. The classic look is complemented by retro-style, bell jar lighting (part of that mixed-materials trend). 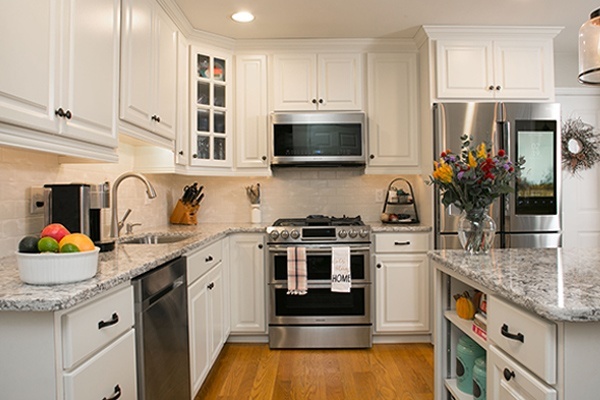 There were two more "must-have" items on her kitchen design checklist: more efficient cabinet storage to eliminate clutter, and a bonafide homework area/office where kids could sit and do their homeowner while eating their snacks during dinner preparation. 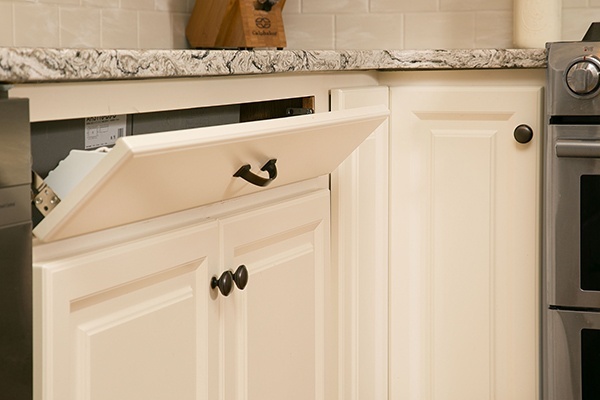 Innovations in cabinet interiors made her first request a cinch; we added pull-out shelves and an integrated, slide-out trash can, along with lazy-susans in corner cabinets and open shelving for cook books and decor. 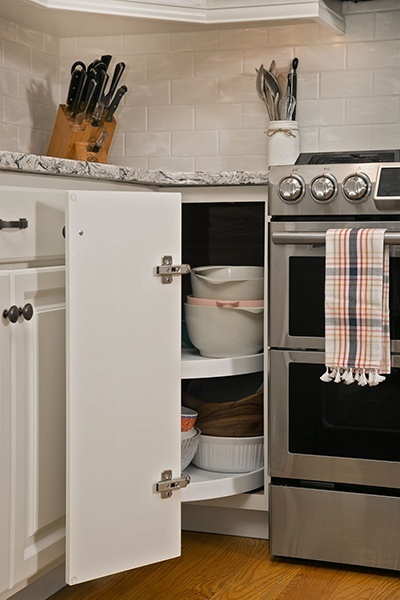 Well-designed cabinet storage eliminated clutter and returned tons of countertop real estate. As far as the kids were concerned, the pièce de résistance is the new home office area. It provides a comfortable space for computer research and typed essays and reports, along with plenty of school/arts/crafts/office supply storage. The spacious island countertop also ensures everyone has a place to sit and with ample room for books and papers - not to mention extra seating for family gatherings and social events. "After meeting with a handful of kitchen remodel contractors, we knew Kitchen Magic was the perfect choice. The process was streamlined, and the value for the quality of work can't be topped. The design and measure team made our vision come to life! To top it all off, all the contractors doing the work were talented, friendly, professional and cleaned up the job site daily. Kitchen Magic was a great experience and the final product is awesome!" These homeowners discovered many of the endless possibilities of remodeling their kitchen via cabinet refacing. New color & style, yes, however, refacing created dramatic design topped with convenient functions for an overall better kitchen experience. This custom space is the result of true ingenuity, style and magic! 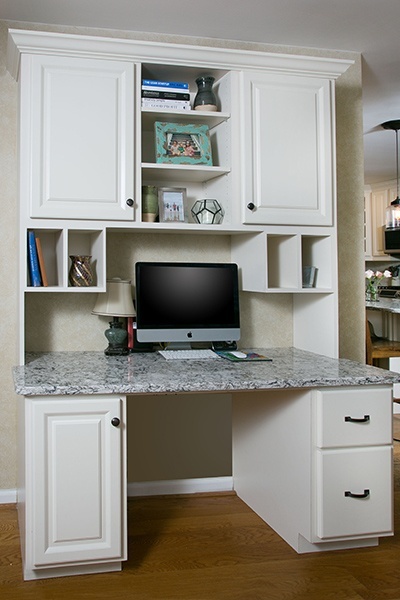 When you think you have limited possibilities with cabinet refacing, think again. This custom space is the result of true craftsmanship, creativity and a little magic! Ready to celebrate the fact that you can have a luxury kitchen design that's kid-friendly too? Schedule a consultation with the Kitchen Magic design team or call (800) 272-5490. Or download more design ideas with our 2019 Design Forecast, filled with current style trends to ensure your new kitchen is in vogue as well. Happy remodeling!